1. Hover over Wiki and click on "Administer Wiki"
2. Click on "Panel Wizard"
3. 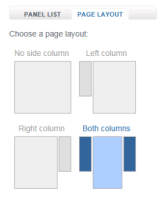 Click on "Page Layout"
4. Click on "Both columns"